Parker Duofold "Duovac" mechanical pencil from 1941. "Blue" finish of striped black, blue, and silver with gold plated trim and a 1/8" cap band. Excellent condition, working very well. Type Vintage mechanical pencil working very well. 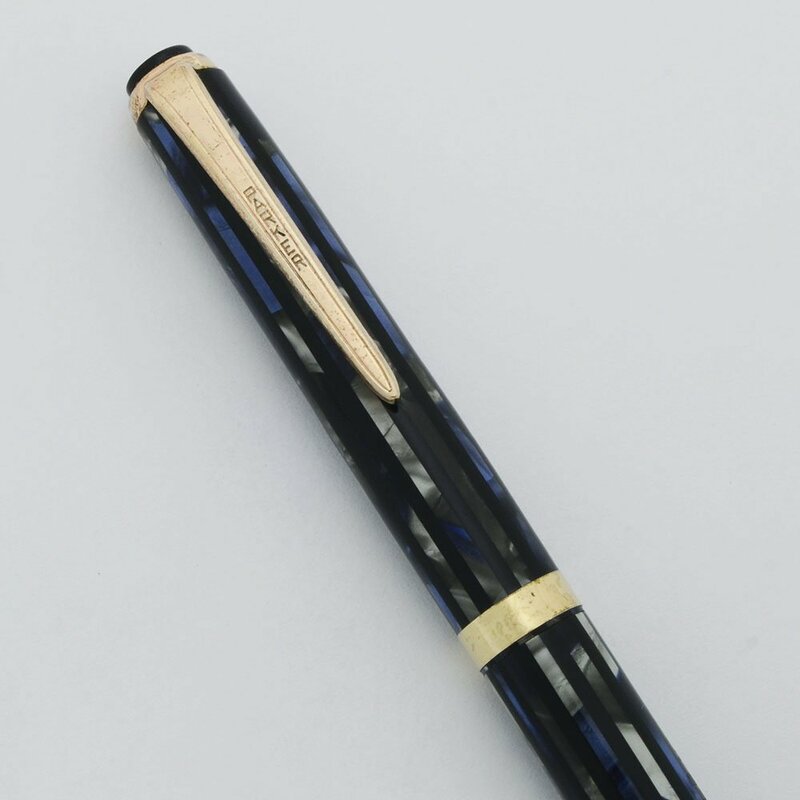 Product Name Parker Duofold aka "Duovac." We're not sure which fountain pen this would have matched, since it has a 1/8" wide smooth cap band. Manufacturer and Year Parker, USA - 1941 (the date code marking is clear, .1.). Filling System Takes 0.9mm, or "thin" lead, which it extends by the traditional twist-method. We'll include a small container of vintage leads. Color They called this finish Blue, it's a pattern of black then silver and blue stripes. Gold plated trim with a 1/8" cap band and a black cap jewel. Condition Excellent condition. The body of the mechanical pencil has scratching, with a few clusters of scratch marks and a few longer thin scratch lines. There is plating wear on the trim ring and the cone. The jewel is in excellent condition. The clip is in excellent condition. The color looks great and the imprint is clear. There are no cracks or chips. Even with the scratching, the pencil is very shiny and the color variation is quite striking. The pencil is working very well. .